This is our treat to kids. They really feel enthusiastic when looking at these polka images all the time in their pillows. Soft fabrics are specially selected for the exterior cushioning and the inside of the pillows, cushions and bolsters are fed with feathers, foams, cotton or any other soft material. We also provide custom shapes on special demand from our clients. 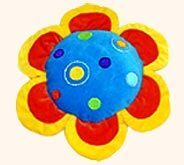 Desc : Created in the shape of flower, this kids decorative pillow possesses multicolored polka dot designs in blue center. Red petals with yellow edge enhance their charm. 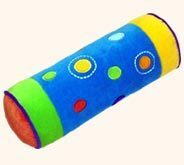 Desc : Colorful polka dots and red, green, yellow & light blue colored border make this rectangular baby designer pillow an eye catching piece. 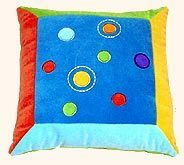 Desc : Kids round pillows incorporate beautiful designs of various enthralling hues. 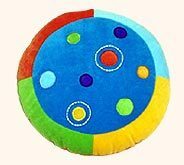 Kids will always use these pillows for a deep and sound sleep. Desc : Elegant in look and comfortable in use. 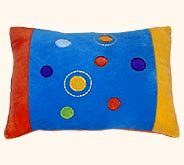 These kids pillows are made enchanting by being adorned with varicolored polka dot designs on smooth cloth. Desc : These kids bolsters having pretty designs of sweet colors convert the kids's room into a royal place with their luxurious appearance.